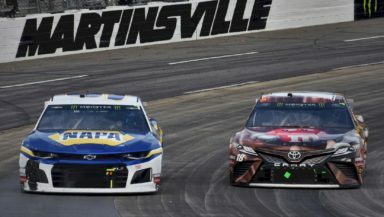 Kyle Busch looks to the inside of Chase Elliott at Martinsville Speedway. Photo by Christian Gardner for SpeedwayMedia.com. After what most considered to be an awkward qualifying session at Auto Club Speedway, NASCAR promised two things: qualifying rule changes coming before Texas, and not going back to single car qualifying. Both were fulfilled on Monday when NASCAR officially announced changes moving forward. During the final round of qualifying at California, none of the 12 drivers made it to the line in time to begin an officially timed lap. NASCAR’s response? Any drivers that fail to run a timed lap in any of the qualifying rounds will have all times disallowed and start at the rear of the field. This includes those that advance into a further round of qualifying. For example, if a driver makes it to Round 3 of qualifying, yet fails to post a lap time, they would start 12th for the race under previous rules. Now, they would be moved to the rear of the entire field for the start of the race. Another frustrating situation for some drivers was the congestion at the end of pit road, blocking some drivers from entering the track if they desired to leave the pits for their timed lap. At the judgment of NASCAR officials, teams could face severe penalties if they end up prohibiting other drivers from exiting pit road. The current structure of qualifying will stay as is: three rounds of qualifying with the first round being 10 minutes, and the last two rounds at five minutes. According to NASCAR’s official statement from their website, Scott Miller, Senior Vice President of Competition, shared that they collaborated “with teams and others in the industry, and there were a few options considered.” Returning to single-car qualifying however was not considered, which was what he initially shared with the media at Auto Club Speedway immediately after qualifying. Busch Pole Qualifying for the Monster Energy NASCAR Cup Series O’Reilly Auto Parts 500 this weekend at Texas Motor Speedway is scheduled for Friday, March 29 at 7:40 p.m. ET.